We have been getting signs that Spring may be on its way. Buds of Hawthorn and Elder have started to split open to allow the brightest of green leaves to squeeze their way out. Yesterday frogs left us a gift in the wildlife pond – a big pile of spawn. Seeing the first spawn this late in the year is unusual as we normally find some in mid-February. Last night the temperature dropped to minus 6! 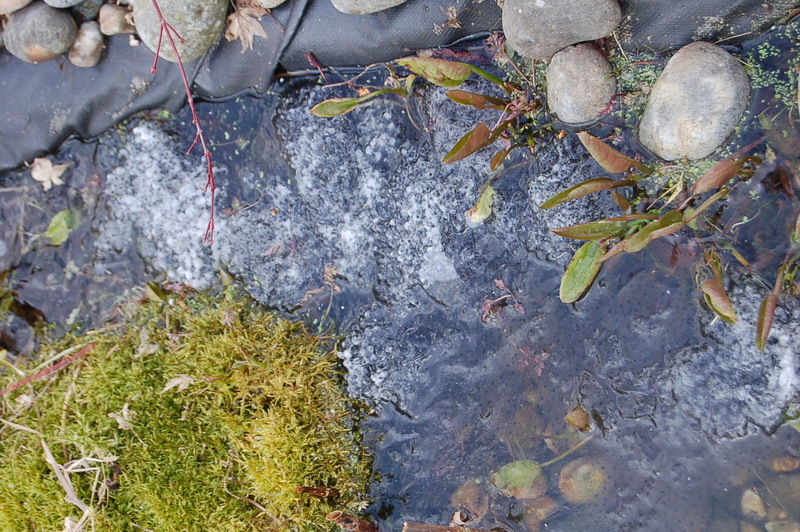 The spawn was frozen into the icy surface of the pond and fluffy snow flakes littered the surface. 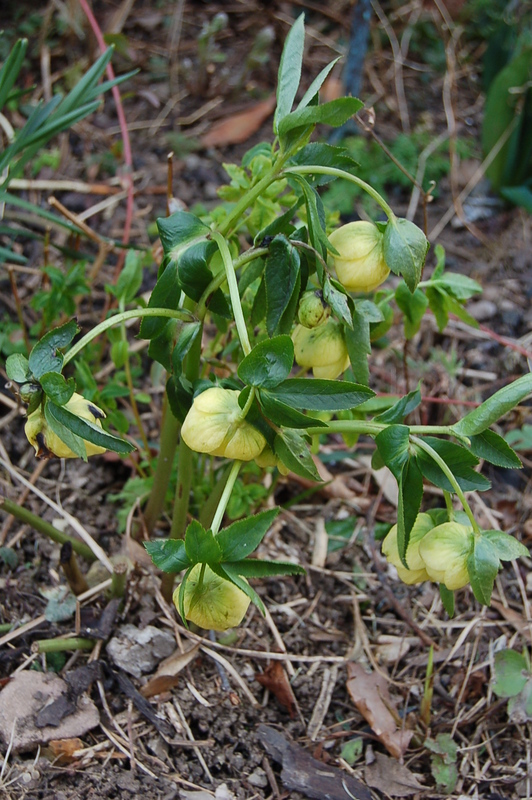 The Hellebores that we have been enjoying so much over the last few weeks drooped losing all their structure. Stems bent over and lowered the flowers to the frozen ground. We know they will burst back when temperatures again rise above freezing and perhaps assisted by a little sunshine. Happily a few plants in the garden have responded more positively to the fall in temperature. The foliage of Hebe “Red Edge” is always colourful but in this spell of renewed cold it has taken on richer tints. This entry was posted in colours, garden photography, gardening, shrubs, wildlife and tagged foliage, foliage plants, frog spawn, frogs, garden photography, garden wildlife, gardening, hebes, hellebores, shrubs, wildlife. Bookmark the permalink. I like your Hebe (not really familiar with it). Hope Spring returns to your area soon. We’re expecting some nice warm weather for the next few days. 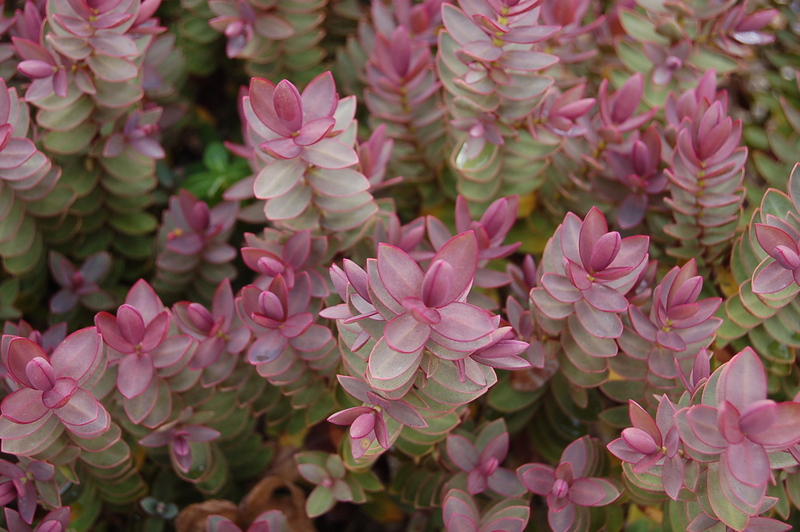 There seem to be a lot of new hebes around at the moment which is good as they add all year foliage colour as well as flowers that repeat several times each year. It’s starting to look like spring! I’ve never seen frog spawn before. But then, since I’m afraid of frogs and toads that’s probably a good thing! I can’t wait for spring to get here. It’s been warmer here, but severe storms are in the forecast for Monday! 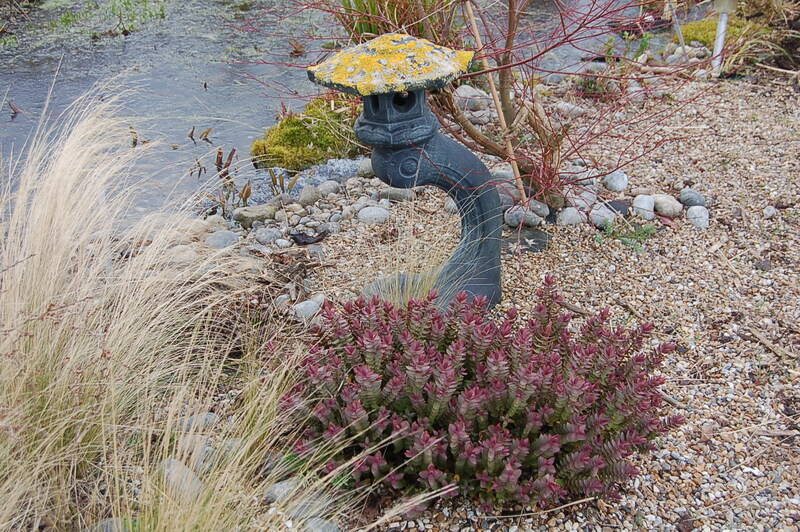 We still have our toad spawn to look forward to – they tend to deposit it in our rill which seems strange. It is a crazy spring. I really miss our wildlife pond, we have a pond here but spawn wouldn’t stand a chance with the Koi. A new wildlife pond is on our list of things to do, a very long list! Beautiful images as always, you’ve reminded me of our beautiful Red Edge from many gardens ago. A beautiful member of the Hebe family. Fingers crossed for warmer weather! I couldn’t be without my pond. We are currently developing a large wildlife pond at our allotment site too – great fun. Everything is so late this year – we still seem to be at the snowdrop stage – hardly any daffodils or even crocuses, although the thorn tree blossom is out! Bizarre and worrying too.I hope your toadspawn survives. All our bulbs are very slow too and lots of the daffodils look as if they are coming up blind. I’m hopeless with hebes for some reason – it’s a shame because some are absolutely gorgeous! 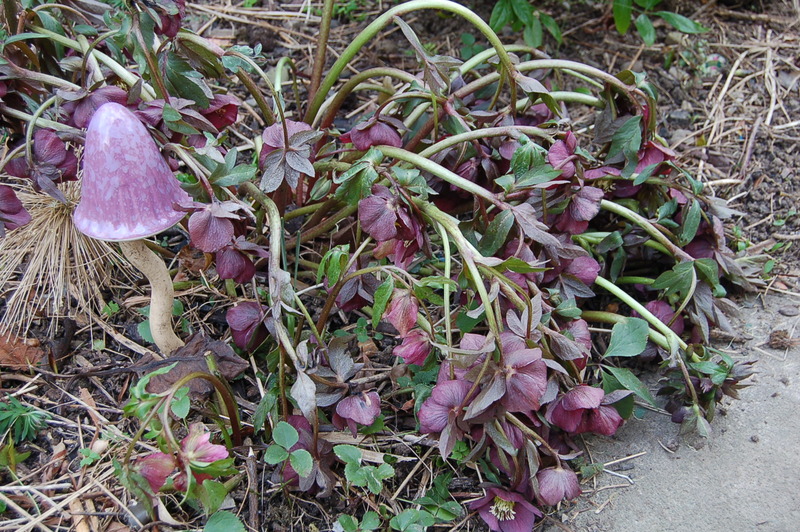 My hellebores are droopy and very sad looking too. Keep trying hebes – how can you cope without them. Hebe is so very pretty! Isn’t it wonderful how the Hellebores recover from a freeze! Very pretty colors you have there. We keep finding more different hebes in local nurseries. Great additions to any garden.